BC Hydro is building a new electrical substation located in Kamloops, BC. The subject site lies on a moderately sloping bench in the saddle between two foothills that requires cut and fill to achieve desired grades. The cut along the southwestern side of the substation property will be supported by a 10m high retaining wall. The site soils are variable in thickness but generally comprise of silt, sand and gravel fill, underlain by loose to compact granular Colluvium deposits extending up to 6m depth. The colluvium is underlain by Glaciolacustrine clay and silt, in-turn underlain by glacial till and bedrock. Groundwater was not observed in any boreholes at the time of soil investigation. The loose to compact colluvium material had the potential to settle if oriented into a denser state, possibly by the introduction of water into the soil matrix. 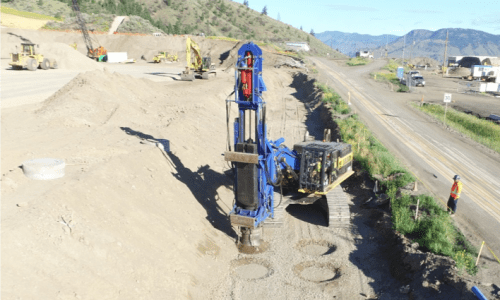 In order to mitigate settlement caused by heavy rain and snow melt during Spring and Fall, Menard carried out Rapid Impact Compaction (RIC) to densify foundation soils beneath the southwestern retaining wall. Standard Penetration Testing confirmed the RIC ground densification program achieved the specified performance criteria.